We’d love your help. Let us know what’s wrong with this preview of Murder with Lemon Tea Cakes by Karen Rose Smith. Daisy, a widowed mom of two teenagers, is used to feeling protective—so when Iris started dating the wealthy and not-quite-divorced Harvey Fitz, she worried . In an old Victorian in the heart of Pennsylvania’s Amish country, Daisy Swanson and her aunt Iris serve soups, scones, and soothing teas to tourists and locals—but a murder in their garden has them in hot water . . .
To ask other readers questions about Murder with Lemon Tea Cakes, please sign up. Murder with Lemon Tea Cakes by Karen Rose Smith is a 2017 Kensington publication. A fantastic start to a new and refreshing cozy mystery series! When Daisy’s Aunt Iris finds herself under investigation for the death of her boyfriend, Harvey Fitz, who was murdered right there in the garden of their lovely tea shop, Daisy must rise to the occasion and find the real killer before her aunt is arrested. Meanwhile, Daisy is dealing with her adopted teenage daughter’s desire to meet her birth mother, a Murder with Lemon Tea Cakes by Karen Rose Smith is a 2017 Kensington publication. Meanwhile, Daisy is dealing with her adopted teenage daughter’s desire to meet her birth mother, and wrestling with the possibility of dating again after the death of her husband. Although this is the first book in a new series, I felt as though Daisy and I were old friends. I immediately bonded with her and really enjoyed the tea shop setting. The tea servings and all the various flavors of tea were described so beautifully, and the shop seemed truly delightful, even if it was a crime scene- and oh my- I could almost taste those lemon tea cakes! Having all the female characters named after flowers is a nice touch, as well. The town square is picturesque, featuring other small businesses, and the characters are all very interesting and maybe a bit quirky at times. All these elements are very important with a cozy mystery of this nature and is part of the charm. The author did a very good job setting the stage for future installments. The murder mystery is also connected to a coin collection that Aunt Iris has inadvertently found herself involved in and is not quite sure how she should proceed, which complicates an already tense situation. The mystery was cleverly planned out, with plenty of viable suspects, which kept me guessing from start to finish. I am very much looking forward to more adventures with Daisy and am curious to see how her love life develops, as well. I picked this book out on a cold, wet day and it was the perfect cure for a gray, dreary day. I love the bright yellow cover, too! This is a very solid introduction to this new series, which also includes a few of the yummy recipes featured in the book! Murder with Lemon Tea Cakes by Karen Rose Smith is the first book in the new cozy Daisy’s Tea Garden Mystery series. Daisy Swanson runs Daisy’s Tea Garden with her aunt Iris where they serve specialty teas and desserts along with catering to events. Daisy is a young widowed mother who since the passing of her husband has come to realize just how important family is to her so she can’t help but worry when her aunt Iris starts seeing Harvey Fitz. What Daisy never expected was for her aunt to find H Murder with Lemon Tea Cakes by Karen Rose Smith is the first book in the new cozy Daisy’s Tea Garden Mystery series. Daisy Swanson runs Daisy’s Tea Garden with her aunt Iris where they serve specialty teas and desserts along with catering to events. Daisy is a young widowed mother who since the passing of her husband has come to realize just how important family is to her so she can’t help but worry when her aunt Iris starts seeing Harvey Fitz. What Daisy never expected was for her aunt to find Harvey murdered just outside in the garden and then become a suspect herself in the murder. Daisy refuses to let the police point the finger at her elderly aunt and is determined to find out just who else would want Harvey dead. The more she questions people the longer her suspect list grows but then she and her aunt find themselves in danger as they are looking for answers. The only thing really that kept me from rating this one at a full five stars was I’d would have liked the characters to have a bit more quirkiness about them to make them stand out a bit more. My favorites cozies are the ones that the characters just pop out of the story and make themselves known and while likable enough Daisy seemed a bit too normal mom/business woman. The murder mystery within the book was one that was a good solid start to the series though so I would be interested in continuing on with these characters in the future. The first half primarily describes Daisy’s Tea Garden and introduces the characters. The second half of the book focuses more on the potential suspects and provides more information on their possible motives. This formula worked really well for me; the scene was set, the characters were introduced, and now it was time to get down to solving the crime. Plus after reading all about the charming Tea Garden, I must admit I had forgotten all about some of the lesser characters. I was soon back on track, making my own prediction, and of course, totally guessing wrong. A great start to a new series and I can see many possible storylines to be explored in future books. I'm looking forward to the next book and more delicious recipes! Daisy Swanson, a widow, and her Aunt Iris have open a tea shop. Daisy set into her hometown after the death of her husband and open the tea shop to order to support herself and her daughters. Aunt Iris is dating a wealthy gentleman who is not yet divorced. Aunt Iris finds her gentleman friend dead in the garden of the tea shop. Aunt Iris is the leading suspect in the murder. Daisy begins to explore the circumstances surrounding the death. Meanwhile, her youngest daughter, who was adopted is looking for her birth Mother. Will Daisy find the answers to both questions? I recommend this book. Recipes are included. I loved this book! I’m definitely going to read a lot more in this series. It was pretty much I craved tea while reading about the delightful tea room, and I ended up drinking three mugs full while reading!! The MC, Daisy, is engaging and interesting, and the mystery was quite tricky to figure out. I’m excited to continue this series! Super squeaky clean, suitable for young teens also. I was lucky enough to win an ARC of Murder with Lemon Tea Cakes from Kensington. I literally devoured this book, almost in one sitting! Karen Rose Smith has created a delightful setting - a quaint tea garden in the middle of Pennsylvania Dutch Country, as well as truly believable characters. The family dynamics at one memorable meal were absolutely spot-on. The heroine, Daisy Swanson, is a widow with two teen aged daughters, who has come to Willow Creek, PA, to help her Aunt Iris with the tea sh I was lucky enough to win an ARC of Murder with Lemon Tea Cakes from Kensington. I literally devoured this book, almost in one sitting! Karen Rose Smith has created a delightful setting - a quaint tea garden in the middle of Pennsylvania Dutch Country, as well as truly believable characters. The family dynamics at one memorable meal were absolutely spot-on. The heroine, Daisy Swanson, is a widow with two teen aged daughters, who has come to Willow Creek, PA, to help her Aunt Iris with the tea shop. When Iris's significant other is murdered right in the tea shop's garden, Iris is a prime suspect. In the face of a stubborn police officer, Daisy must fight to clear her aunt's name. This was an awesome start for a brand new series. I thought it was really well-written, descriptions were just right as in not over the top descriptive and I could totally picture this little town in Pennsylvania near Amish country with all its fun shops. There were a lot of characters but I never felt overwhelmed since each one was dealt with in such a way that I felt like I knew them, even if it was someone the reader isn't really supposed to like. Daisy and her aunt Iris had opened Daisy's Tea This was an awesome start for a brand new series. I thought it was really well-written, descriptions were just right as in not over the top descriptive and I could totally picture this little town in Pennsylvania near Amish country with all its fun shops. There were a lot of characters but I never felt overwhelmed since each one was dealt with in such a way that I felt like I knew them, even if it was someone the reader isn't really supposed to like. Daisy and her aunt Iris had opened Daisy's Tea Garden in Willow Creek, PA a couple years ago after Daisy's husband Ryan had passed. She and her girls, Jazzi and Vi, had moved back home from FL. The tea room and garden were doing pretty well until Aunt Iris's almost-fiance was murdered in the garden. Since the police had it in their minds that Iris was guilty, Daisy knew she had to investigate and get it solved before her aunt ended up in jail. Daisy's old friend Cade who had been her high school crush was cautious and didn't want her to investigate but her new friend Jonas who owned a nearby furniture store had been a detective in Pittsburgh and while he knew the dangers of investigating, he understood Daisy's need to do that. With two guys in her life now, each one of them being super nice, Daisy had her share of confusion although she admitted to herself that Jonas sparked a little something in her when he was around. It'll be interesting to see which one she ends up with. At this point, I don't even know which one I prefer--I like them both! Jonas did seem more attentive but he was also helping with a little side story of helping Jazzi, Daisy's adopted daughter, find out who her birth mom was. The many fun characters weren't hard to keep separate. They were distinctive and some were quirky. Aunt Iris was very sweet and could be feisty when riled so I really enjoyed reading about her. I was sad about her fiance but knowing her, she may find someone else. I also really liked Sean, Daisy's dad who seemed to be the voice of calm and collected in the family when his wife Rose and her sister Iris didn't agree on things. It wasn't daytime drama disagreements or anything though. They were still a very close family and realized that family did indeed come first. I liked the addition of college age Foster helping in the tea room--Daisy's daughter Vi was really eyeing him up! This is the first book in a new series by Karen Rose Smith and I enjoyed it. It takes place in a small town with Daisy as the main character. Daisy has returned to her hometown after the death of her husband. She and her two daughters are living in a renovated barn and she and her Aunt Ivy have started a business. Purchasing an old Victorian home, they have opened The Tea Garden. All is going well until Harvey, Ivy's boyfriend, is found dead, bludgeoned in their back garden. Of course, Ivy is a This is the first book in a new series by Karen Rose Smith and I enjoyed it. It takes place in a small town with Daisy as the main character. Daisy has returned to her hometown after the death of her husband. She and her two daughters are living in a renovated barn and she and her Aunt Ivy have started a business. Purchasing an old Victorian home, they have opened The Tea Garden. All is going well until Harvey, Ivy's boyfriend, is found dead, bludgeoned in their back garden. Of course, Ivy is a suspect and Daisy is determined to do what she can to get her aunt off the suspect list. This is the first book in a new series by Karen Rose Smith and the first work that I have read by this author. I thought it was a very pleasant read. I enjoyed the setting of the tea room and thought the characters were charming. Daisy is a widow raising her youngest daughter at home and trying to make a go of the tea room with her aunt. I think reader will connect with Daisy and find her to be a main character that is likable. I also enjoyed that family played an important role in this story. I This is the first book in a new series by Karen Rose Smith and the first work that I have read by this author. I thought it was a very pleasant read. I enjoyed the setting of the tea room and thought the characters were charming. Daisy is a widow raising her youngest daughter at home and trying to make a go of the tea room with her aunt. I think reader will connect with Daisy and find her to be a main character that is likable. I also enjoyed that family played an important role in this story. I always enjoy a cozy mystery that has food and family at it's center. The mystery was solid and the author wove her clues throughout the story. I think fans of this author's other series will certainly be drawn to this one as well. Murder with Lemon Tea Cakes by Karen Rose Smith is the 1st book in the Daisy's Tea Garden Mystery series, and a great book. Daisy Swanson, a widowed mother of two daughters, along with her Aunt Iris open the tea garden. Iris is dating a not quite divorced man, when he is found murdered, and Iris becomes a suspect. Daisy can not let anything happen to Iris, and is determined to find the real murder. Once I started this book I could not stop reading it. It was a quick read that kept me guessing. 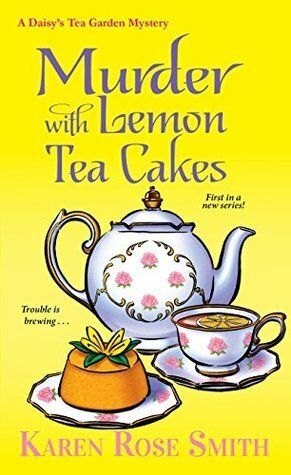 I Murder with Lemon Tea Cakes by Karen Rose Smith is the 1st book in the Daisy's Tea Garden Mystery series, and a great book. Daisy Swanson, a widowed mother of two daughters, along with her Aunt Iris open the tea garden. Iris is dating a not quite divorced man, when he is found murdered, and Iris becomes a suspect. Daisy can not let anything happen to Iris, and is determined to find the real murder. Once I started this book I could not stop reading it. It was a quick read that kept me guessing. I look forward to the next book in the series. I strongly recommend this book for all cozy mystery book lovers, you will not be disappointed. I thought this was super cute. This is the first in a new series. The tea shop is just darling and makes me wish I could visit. Daisy is great! I love how she looks out for her Aunt Iris. Cozy mystery readers will enjoy this and getting to know Daisy. Just love these type of books! Karen Rose Smith has hit a grand slam homer with her fabulous first in a new series, Murder with Lemon Tea Cakes! I thoroughly enjoyed it and am eagerly looking forward to the next one. The author has the perfect elements – very likable characters, a lovely Tea Garden with scrumptious-sounding food, and a mystery that will stump some of the most diligent readers. Daisy Swanson wears many hats – widowed mother to teen girls Violet and Jazzi, as well as daughter, sister, niece, and business owner/ Karen Rose Smith has hit a grand slam homer with her fabulous first in a new series, Murder with Lemon Tea Cakes! I thoroughly enjoyed it and am eagerly looking forward to the next one. The author has the perfect elements – very likable characters, a lovely Tea Garden with scrumptious-sounding food, and a mystery that will stump some of the most diligent readers. Daisy Swanson wears many hats – widowed mother to teen girls Violet and Jazzi, as well as daughter, sister, niece, and business owner/ manager. Her beloved Ryan passed away three years earlier, and she packed up and returned to Willow Creek, Pennsylvania. She and Aunt Iris found the perfect location for a tea shop that also sells pastries baked in-house and serves proper afternoon tea. Tessa, her best friend since high school, is her chef, who also rents the second floor of the Victorian home housing Daisy’s Tea Garden. Iris is dating a man who treats her as she deserves to be in every way except one. Harvey is still married, although is only weeks away from the divorce being final. While Daisy wished he was already divorced, she is not as outspoken about it as her mother, Iris’ sister. Harvey is a wealthy man, owning a specialty store called Men’s Trends for twenty-five years. Harvey rented the tearoom for a full Sunday for an invitation-only celebration of the stores’s anniversary. His adult son and daughter attend and have a mild spat, and Harvey’s soon to be ex-wife crashes the party but is quickly led out by another attendee. Based on things that Harvey tells Iris, she knows he wants to discuss their future as soon as his divorce is final. Iris is excited to meet Harvey one evening after work. It begins no different from others in that Harvey will meet Iris in the garden at the Tea Garden. When Iris sees Harvey, however, he is dead, having clearly been murdered. The detective in charge of the case believes Iris killed Harvey, perhaps in collusion with Daisy. I find the relationships between family members and loved ones fascinating. I learn the most about the ladies in Daisy’s family from the challenges between sisters and how one’s mother can help them grow closer or farther apart. Daisy helps each daughter see her strengths as equal to her sister’s, and she shows Vi and Jazzi that they are equally her beloved daughters, whether by birth or adoption. I really like Daisy and Iris, and Daisy’s new acquaintance, Jonas, and his helpfulness in her family’s needs . There are unique elements to the plot, including twists that change the course of the investigation or how dangerous the bad guy/ gal is. Determining who might be the killer is a challenge, as there is little evidence. I had a tiny suspicion at one point, yet also considered red herrings when they looked better than my guess. The solution was surprising as I had so readily discarded the person. I appreciate seeing that there is more in Daisy’s life than work and finding a killer. The author demonstrates sensitivity through Daisy’s familial relationships and the needs of her daughters. There is a depth to Daisy and Iris that makes them fully three-dimensional, and I am looking forward to getting to know them better in upcoming mysteries. I highly recommend Murder with Lemon Tea Cakes; it is one of my favorite new series in 2017! Daisy Swanson and her aunt Iris run a teashop in the middle of Pennsylvania's Amish country. Daisy is a widowed mother of two, one who has just left for college and the other in high school. Iris, who never married, has recently become involved with Harvey Fitz, who is in the process of a divorce. When Harvey is found murdered in the tea garden, Iris makes the top of the police's suspect list. It is up to Daisy to get to the bottom of things before a killer strikes again. If there were a place fo Daisy Swanson and her aunt Iris run a teashop in the middle of Pennsylvania's Amish country. Daisy is a widowed mother of two, one who has just left for college and the other in high school. Iris, who never married, has recently become involved with Harvey Fitz, who is in the process of a divorce. When Harvey is found murdered in the tea garden, Iris makes the top of the police's suspect list. It is up to Daisy to get to the bottom of things before a killer strikes again. If there were a place for it, I would give this book 3 1/2 stars. It has a wonderful setting that is extremely cozy and made me want to sit down for tea and scones. I liked Daisy and her family, and the interactions between them. They were perfectly drawn and I could see them as real life people, which makes for a great read. Daisy especially spoke to me, a widow who was working to put her life back on track, and who worked to keep her children at the forefront of her life. The one tick I had with this book is I felt as if the possible romances for Daisy, between two different men, and her daughter's hunt for her birth mother, took top billing over the mystery. I would have liked a few more twists and turns that made me wonder who the killer was. Instead I figured it out partway through and my mind never changed. Still, I liked the story and the setting enough that I look forward to the next book in the series. Murder with Lemon Tea Cakes in the first in the Daisy’s Tea Garden Mystery by Karen Rose Smith. The main characters are Daisy Swanson and her maternal aunt, Iris, is set in Willow Creek, Pennsylvania. Both are co-owner’s of a business named Daisy’s Tea Garden. Daisy, a widow with two daughters, has worked with her aunt to establish the Tea Garden which included spaces for those who wanted to just buy their tea and baked goods/soup, but also could accommodate those who enjoyed an afternoon tea. I Murder with Lemon Tea Cakes in the first in the Daisy’s Tea Garden Mystery by Karen Rose Smith. The main characters are Daisy Swanson and her maternal aunt, Iris, is set in Willow Creek, Pennsylvania. Both are co-owner’s of a business named Daisy’s Tea Garden. Daisy, a widow with two daughters, has worked with her aunt to establish the Tea Garden which included spaces for those who wanted to just buy their tea and baked goods/soup, but also could accommodate those who enjoyed an afternoon tea. Iris, having never married, was currently being courted by Harvey Fitz, the owner of Men’s Trends. Daisy finds it amusing how her aunt acted when Harvey was around, but she was also troubled because Harvey still being married but separated. Ms. Smith has developed the characters very well and the description of the tea garden makes me want to sit down with a cup of tea and a lemon tea cake. Through in the romance and also a murder and what more could a reader want. It will be interesting to see what adventure is next for Daisy and Aunt Irma. Good start to a new series! Great recipe at the end! This is the author’s first in a new series: “A Daisy’s Tea Garden Mystery”. Daisy, widow with two teen daughters has opened a small-town Pennsylvania teashop with her aunt Iris. Her Aunt’s new boyfriend gets murdered and Daisy tries to protect Iris from a suspicious cop. Two possible boyfriends (of course) for Daisy plus her adopted daughter’s search for her birth mother add side interest. Good, but not great. A standard entry in the cozy mystery genre which will always have my heart. ALWAYS. I enjoyed the characters and the setting for this one and found the mystery to be pleasant. This is one I picked up because my mom was reading it, and I thought it'd be fun if we could talk about it. In the end I owe her a debt of gratitude because I adored this book! The characters are so much fun, and the relationships between them are heartwarming and feel so real. I found myself charmed over and over again by scenes and interactions between the characters and touched by the care they seemed to have for one another. And the mystery itself was a puzzler. I literally figured it out one This is one I picked up because my mom was reading it, and I thought it'd be fun if we could talk about it. In the end I owe her a debt of gratitude because I adored this book! And the mystery itself was a puzzler. I literally figured it out one sentence before the reveal, and I definitely didn't see it coming. Yet it made perfect sense in the end. All in all, I highly recommend this one, especially if you're a fan of tea! Murder with Lemon Tea Cakes by Karen Rose Smith is the first book in A Daisy’s Tea Garden Mystery series. Daisy Swanson co-owns Daisy’s Tea Garden (housed in a beautiful old Victorian) with her aunt, Iris Albright in Willow Creek, Pennsylvania. Iris has been dating Harvey Fisk who is working to obtain a divorce from his wife, Monica. At a party honoring the 25th anniversary of Harvey’s store, Men’s Trends at Daisy’s Tea Garden, Monica storms in and accuses Harvey of hiding assets. Iris leaves to Murder with Lemon Tea Cakes by Karen Rose Smith is the first book in A Daisy’s Tea Garden Mystery series. Daisy Swanson co-owns Daisy’s Tea Garden (housed in a beautiful old Victorian) with her aunt, Iris Albright in Willow Creek, Pennsylvania. Iris has been dating Harvey Fisk who is working to obtain a divorce from his wife, Monica. At a party honoring the 25th anniversary of Harvey’s store, Men’s Trends at Daisy’s Tea Garden, Monica storms in and accuses Harvey of hiding assets. Iris leaves to meet Harvey for a date and Daisy hears a scream. Harvey is dead in their herb garden from blunt force trauma and one of their statues is missing. Detective Rappaport is on the case and he has decided Iris is the culprit. Daisy with the help of former detective, Jonas Groft start investigating the suspects. It turns out that Harvey had recently changed his will which angered his children. Who could have murdered Harvey Fisk? Daisy is worried about her youngest daughter, Jazzi. She has been acting out lately, and Daisy discovers that Jazzi wants to locate her biological mother. Business is booming at the tea garden courtesy of Harvey’s murder and Daisy brings on additional staff. Daisy questions the suspects and follows the clues in the hopes of catching the real killer (and removing Aunt Iris from the suspect list). Murder with Lemon Tea Cakes is nicely written and has a good pace. The author set the stage in this book for the series. She establishes the characters, Daisy’s Tea Garden, and the town. I found the characters to be congenial and relatable. Daisy is a smart, strong and caring woman who loves her family and is striving to make a success of her new business. She is a widow with two daughters (one biological and one adopted). Thanks to Karen Rose Smith’s description, I can picture Daisy’s Tea Garden in my head. She provides sumptuous descriptions of the tea and food served at the tea garden (recipes at the end of the book). I was not a fan of cantankerous Detective Rappaport, but their does need to be one disagreeable character. He was like a dog with a bone. He gets a hold of an idea and does not let go. The mystery was appealing with several suspects and misdirection. The investigation mostly consisted of questioning. The murder was not the prominent part of the story. The mystery can be solved before the reveal if pay careful attention to the clues. More time is devoted to the tea garden, Daisy’s family, food descriptions, tea, talking and flirting. There are two possible romantic partners for Daisy. I am sincerely hoping that this will not result in a love triangle in future books in the series. Murder with Lemon Tea Cakes is a good story, and I will be reading the next book in A Daisy’s Tea Garden Mystery series. Fans of Karen Rose Smith and A Caprice De Luca Mystery series will be entertained by Murder with Lemon Tea Cakes. A fun new cozy mystery series. Already have the next book pre-ordered! 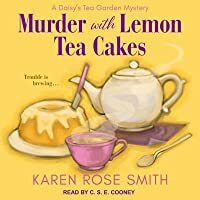 Murder with Lemon Tea Cakes is a great start in a new series (Daisy's Tea Garden Mystery) by Karen Rose Smith. This is a light and relaxing read, with a great cast of realistic characters and an intriguing murder mystery with lots of twists and turns and possible suspects. I’m already looking forward to reading the next installment in this series. Daisy Swanson is a widow, with two daughters (Jasmine, who is in high school, and Violet, who is away at college) who moved back to the small town of W Murder with Lemon Tea Cakes is a great start in a new series (Daisy's Tea Garden Mystery) by Karen Rose Smith. This is a light and relaxing read, with a great cast of realistic characters and an intriguing murder mystery with lots of twists and turns and possible suspects. I’m already looking forward to reading the next installment in this series. Daisy Swanson is a widow, with two daughters (Jasmine, who is in high school, and Violet, who is away at college) who moved back to the small town of Willow Creek, Pennsylvania, to be near family. She and her aunt, Iris Albright, are co-owners of a quaint tearoom, Daisy’s Tea Garden. Harvey Fitz is the owner of Men’s Trends, a high-end men’s clothing store, is in the process of divorcing his wife, Monica, and wants to marry Iris once his divorce is final. When Harvey is murdered in the tearoom’s garden, it appears Iris may be Detective Morris Rappaport’s the prime suspect and Daisy sets out to prove her aunt is innocent. Daisy and her deceased husband, Ryan, adopted their youngest daughter and even though Jasmine grew up happy, knowing she was loved, she’s decided she wants to find her birth mother. Daisy has mixed feelings but is determined to help her daughter and engages the help of Jonas Groft, a retired detective and current owner of Woods, a furniture store.